Today's card is another simple one. Do I make too many simple cards??? Probably, but I like them. 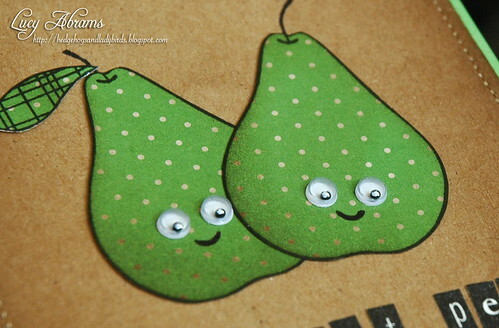 Just some sweet pears, stamped on polka paper, inked with distress ink, and dolled up with a smile and google eyes. :) LOVE me my google eyes. 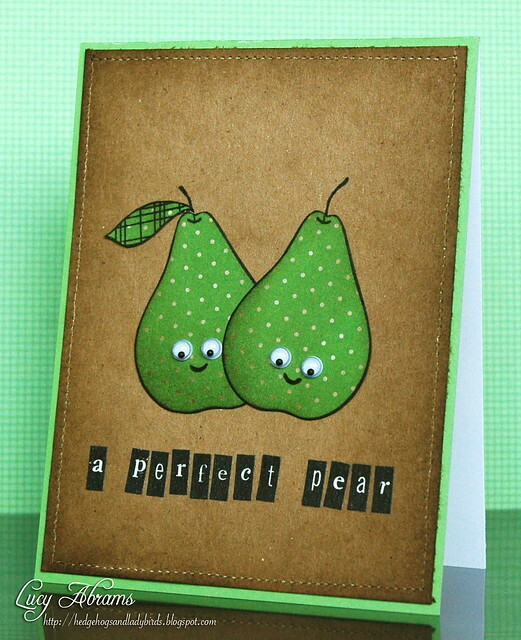 This card is perfect, or sorry - Pear-fect!! You say it's a simple card, but why make it more complex, it's lovely! And these are maybe more difficult cards to think up, than more decorated ones. I love it! And those eyes are so funny. Love your 'simple' cards and google eyes! I did pears today, too! LOVE the googly eyes on this one...too fun! Keep making cards in your favorite clean style...definitely not simple because they are so stunning...I love them!! Adorable card, Lucy! Love how bright the green is! This is too cute, love the jiggly eyes! This is so cute and fun, Lucy! I always love your cards! Many times simple is SOOOOO much better. And googly eyes adds expression! I LOVE it! Super cute as ever! Love your 'simple' style, Lucy! I don't think you could ever make too many simple cards. Although I could be biased, because simple cards are my favorite. :) Please keep sharing your cards! I like this one! our minds meet! Did you see my weekend video? same idea different approach! Fun! hee... this makes me smile. those pears are too cute! lovely card!